At the heart of all mission critical fuel oil systems is a pump set or transfer set as they are sometimes referred to. These sets are used to move oil from a large main storage tank to a point of use. 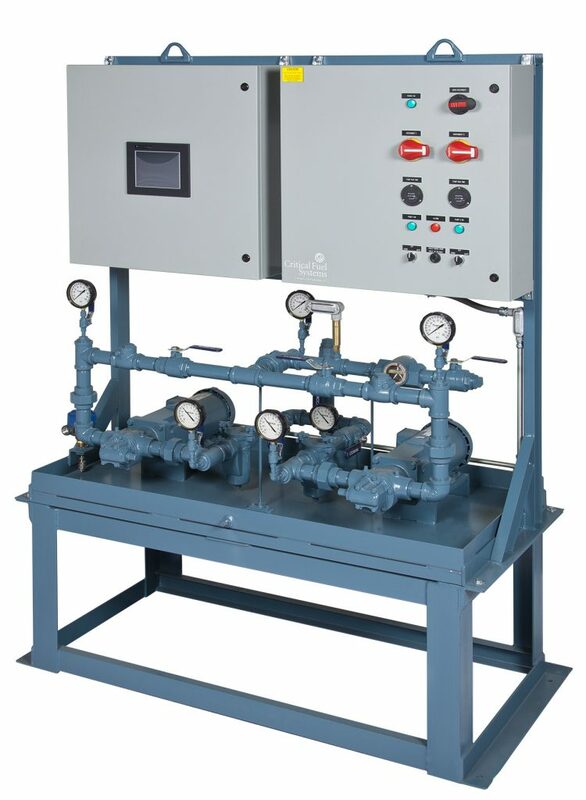 Pump sets are found with emergency generators and boilers for mission critical applications. Our pump sets are designed with the requirements of mission critical application in mind and are rigorously tests at the factory before shipment. Pump sets are found in a duplex design where two full flow pumps are used to move fuel oil. In some applications such as return pumps a single or simplex pump is used. The pumps are selected to match the application and are mated to motors as required to match the available power sources. The motor horsepower required is proportional to the desired discharge pressure. Our standard sets are offered for 50psi, 100psi, 150psi with higher pressure sets custom designed for the application. The pump set will actually develop the discharge pressure based on the downstream restrictions and the elevation differences. Pump sets will typically include inlet strainers to protect the pumps and are either duplex or simplex. The pump operation is monitored by suction as well as discharge pressure gauges. A flow switch is often used to monitor flow and to select the backup pump if no flow is detected after a set time delay. A leak sensor in the base pan is used to monitor for leaks at the pump set. Each pump is provided with an emergency relief valve in case of downstream restrictions. These relief valves are external (recommended) but internal relief valves can be provided. Controls can range from very simple motor starters to highly integrated control packages with touch screen based operator interfaces. Each pump is provided with an ability to be turned off for service, turned on for manual operation, or turned to automatic mode where the control system will monitor and control the pumps. Automatic “lead lag” alternator circuitry is used for automatic switching of the lead pump with each call for operation. The control package can include a group of control panels which can communicate over a network, allowing the pump set controller to “talk” to other pieces of fuel oil equipment. Protocol convertors are used to transfer system data to the “Building Automation System” for overall monitoring. On day tank applications the pump set is controlled by level switches contained in each day tank. These switches include a “pump on” level and a “pump off” level to control the filling of the tank. In some applications a “low level” switch is used to turn on both pumps at the same time to “catch up” on filling the tank. A “high level” switch may be used to turn on a return pump in cases where the day tank may be overfilling. Critical Fuel System can provide pump sets for any size of flow and pressure that is found in mission critical applications. CFS Overview Brochure Provides a complete review of all the components that make up a system. Pump Set Brochure Provides an overview of pump set systems.